Welcome to the Stumpf Balloons web site and online catalog. Stumpf Balloons offers an extensive assortment of products for Hot Air Balloonists, and one of the most comprehensive selections of hot air ballooning equipment and services available anywhere in the world. Even if you're not a balloonist, you will still see many unique and hard-to-find items throughout our site. As always, I offer friendly professional advice from a real live person, M-F 9-5 Eastern time. Call 1-802-875-1600 or e-mail psstumpf@aol.com. BANNERS - We make gorgeous, digitally printed, full color hot air balloon banners! THE STUMPF HEAVY DUTY ENVELOPE CARRY BAG...Still setting the industry standards. PROPANE REFUELING FILTER, can be added to any refueling adapter. 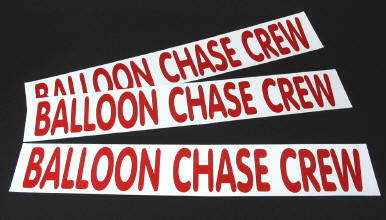 BACK IN STOCK -- NEW BOLDER LETTERING, MAGNETIC CHASE CREW SIGNS!! Stumpf Balloons Repair Station CRS RG5R170N. We Service ALL brands. "Ask the Repairman" query page. Have a balloon maintenance question? We have serviced all major hot air balloon brands for over 25 years. The used balloon equipment Garage Sale. Bargains galore on all sorts of hot air ballooning odds & ends. Some unusual collectable items. Used hot air balloons, baskets, tanks, burners. I am not currently listing used balloon systems on this website at this time. Stumpf Cold Air Balloons. We are not currently manufacturing cold air balloons or display balloons. Stumpf Hot Air Balloon Banners. We're known for our high quality & great fit. Our banners are state of the art, digitally printed full color, custom made to your specifications. Ballooning Photography by Paul Stumpf. 25 years of balloon and aerial photos. Paul holds a Bachelors Degree in photography from The Rhode Island School of Design ( RISD ).